No sign of Atlas anywhere else, so he looks like a brand new-bie. Consequently, I had no indication as to how tough this would be. Seven clues omitted one or more letters from the wordplay, and just to make things even trickier, the definition refrred to one of the other seven. Twntey-four other clues had the wordplay leading to one answer with one letter wrong, the incorrect letters spelling out an instruction. Well, if the clues were as tough as the preamble indicated, I was in for a bit of a marathon. However, 1ac Beginning to excavate old prison bar from the past (5) was straightforward from the definition and led to ESTOP, the wordplay being to ESHOP. Looking at 1dn Misrepresented Mao in doctrine of U-turns (13), that looked like an easy anagram, so I guessed that would be ENDO-something, and with 11ac NAB, it looked like an easy solve lay ahead. That was not to be. After 35 minutes, I had just ten clues solved, and another 20 minutes later, a nice round dozen. Moreover, 16 NURS made me think that 1dn wasn’t ENDO-anything! Unfortunately, Mrs B didn’t have an entry for U-turn, so I tried volte face and this time she didn’t disappoint — ENANTIODROMIC got slotted in. Having also got GOVERNORSHIPS at 8dn, things looked positive. The wrong letter given by wordplay began HI…H…G… and I suppose it seemed obvious that we would be required to get out the magic marker later. There followed nearly two more hours of slow solving with some interesting clues on the way. I found the misplaced definitions particularly deceiving. For example 15dn Post-impressionist artist discarded Virgin (8) which was RA (artist) + PUZEL (obs virgin, and a new word to me) with the definition being at 27ac who occasionally let hair down. 2dn A monkey? I don’t trust that suggestion of 14 shillings! (6) took me longer than it should have, being HA (misprinted SA) + GUIN(ea) (ie, 2/3 of a guinea)! The incorrect letters provided by the wordplay spelt out Highlight your achievement. I thought that highlighting the whole grid would be appropriate, except we were told that it was only 19 cells. The message also told us which of LEAD or LEAR needed to be entered at 43ac. 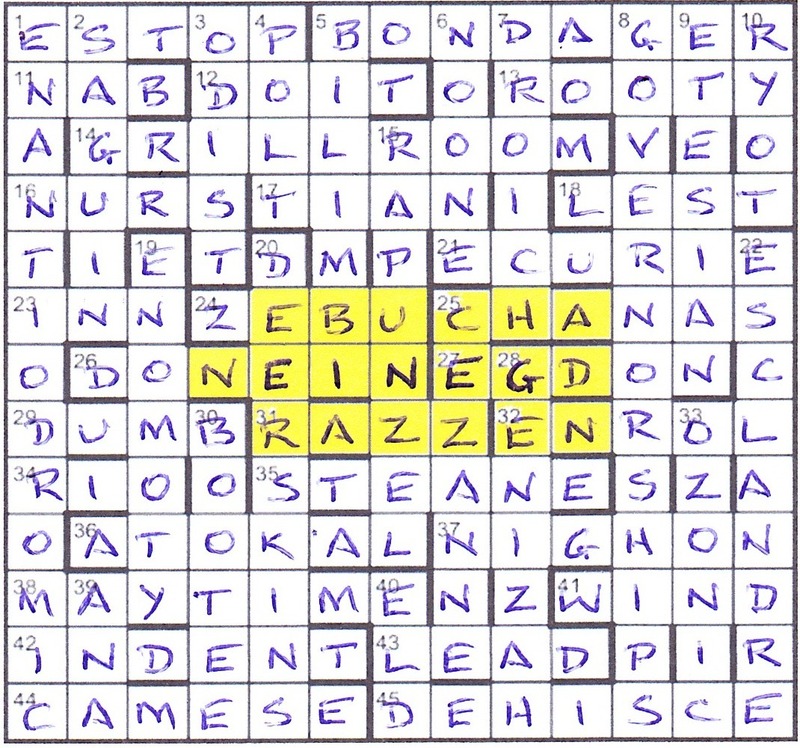 I had taken the precaution of shading the letters which were not supported by the wordplay, one letter in each of five down clues plus the same letters crossing in 26ac and 27ac. These were EINEG, which looked like it could become GENIE. Seeing NEBUCHADNEZZAR outside my shaded cells made the total 19, as required. I now fumbled around for about 45 minutes wondering whether I had to let the genie out of the bottle and erase the central cells. Somehow, that didn’t really seem to work, and I felt sure that we would have been given more of a help if that were the case. And anyway, it wasn’t really an achievement. Luckily, the penny finally dropped as I realised that we were required to put the GENIE back in the bottle. Thanks for an enjoyable puzzle, Atlas. The clueing was suitably tough and ingenious, and the endgame didn’t take too long before it all came together nicely. This entry was posted on 3 February 2017 at 4:00 pm	and is filed under Solving Blogs. Tagged: Atlas, Yes You Can. You can follow any responses to this entry through the RSS 2.0 feed. You can leave a response, or trackback from your own site. Wonderful graphics, Dave, as usual. Thanks, Shirley, they’re regularly taking longer to create than the puzzle takes to solve!